JULIKA is lavishly attired in a modern ethnic look. She wears a loose off white printed dress with cap sleeves over underwear and a striped underdress with a patterned flounce at the hem. JULIKA is lavishly attired in a modern ethnic look. She wears a loose off white printed dress with cap sleeves over underwear and a striped underdress with a patterned flounce at the hem. There is nothing matchy -matchy about her outfit, which also includes lace -trimmed jeans shorts, lavender leggings and ankle boots topped with beaded and tassled ankle warmers. Her lined faux -fur shrug with a pink cord makes a charming addition to her outfit. Julika’s long hair is held to the side by a ribbon ring. Julika is a stunning brown haired 46cm/18" vinyl play doll. She has a gorgeous fresh, natural face with fixed lifelike blue unbreakable acrylic glass eyes and long brown lashes. Julika has very long, beautiful brown wigged hair made of high quality kanekalon, considered the best fibre for doll hair, in which she wears a ribbon in her hair. She is a highly poseable doll, having 11 points of articulation, 2 more than Happy Kidz as her wrists are jointed, too. These joints mean she can be positioned in a natural way, very appealing to an older child's imagination. 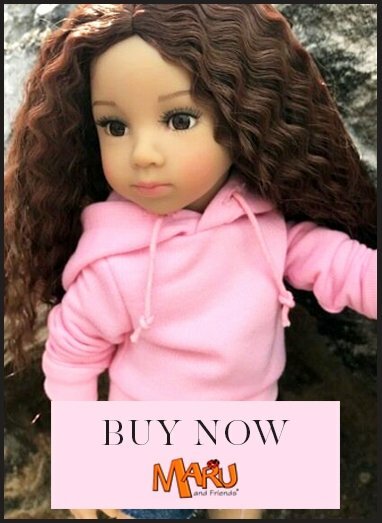 Julika is safety tested for children from age 3 but we recommend her to children age 8 and above as jointed bodies can be tricky to pose and slimmer full vinyl bodied dolls are hard not soft to hold, cuddle and play with. Julika''s hair can be cared for by the Essential Doll Hairbrush, highly suitable for wigged hair as it detangles whilst being gentle on the hair.